Comfortable, discreet, exceptional protection for women. Body-contoured anatomical design for the feel of everyday underwear. Pink SensiSoft offers an extra soft, garment-like fit. Soft, anti-leak guards help to reduce leakage and improve containment. Super absorbency core wicks fluid away quickly to promote dryness and help maintain skin integrity. FitRight Pink makes a difference in the lives of the women in your care...and women everywhere. 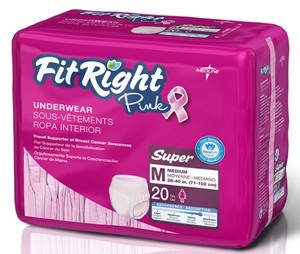 Your purchase of FitRight Pink helps us support the National Breast Cancer Foundation. Medline donates a portion of the proceeds from each sale of Medline pink branded products to the National Breast Cancer Foundation (NBCF).